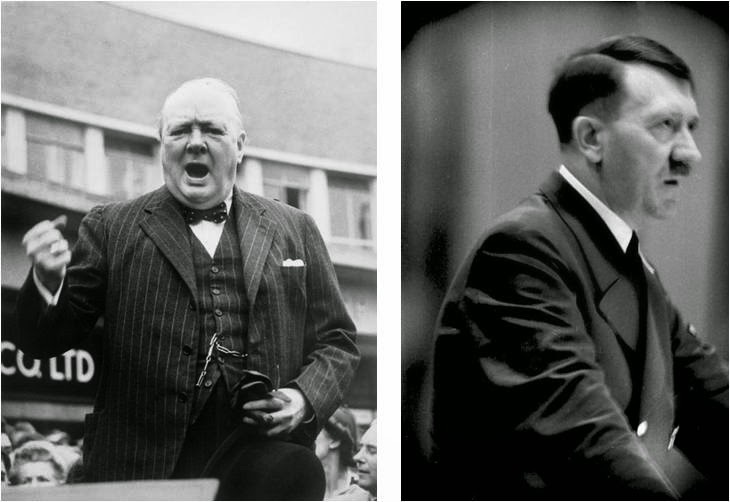 Winston Churchill and Adolf Hitler are often thought of as polar opposites. In the public consciousness Churchill represents peace, bravery, and equality, while Hitler stands for war, cowardice, and persecution. Churchill is good and Hitler is evil. These characterizations have been implicitly and explicitly propogated through educational institutions, popular media, and historical scholarship. But little consideration has been given to the strong similarities between the two leaders. Churchill (left) and Hitler (right) delivering speeches. Both men were tremendous orators. Both men shared fundamental talents and proclivities which made them powerful leaders. It was the competing purposes behind their leadership that differentiated Churchill and Hitler. Mental Floss quiz to see if you can tell Churchill's paintings from Hitler's. I scored a 50% (no better than guessing!) How did you fare? I took the paintings quiz and scored a 6/10. I have to admit I guessed at most of them. There's many interesting facts in this blog. Great job! Keep the blogs coming! Yes that quiz can be quiet tricky. Thanks. New posts will up shortly!